The story of the death coach of Ballyduff is from Irish folklore about one man’s freighting experience of seeing the Cóiste Bodhar. All over Ireland not only do we listen for the sounds of a Banshee we will also be on the lookout (fearfully so) for the Cóiste Bodhar, the Irish for deaf or silent coach or more commonly known as the death coach. It is said that if death is upon us or someone we know, mainly a family member, then it cannot return from whence it’s been sent without a passenger. The most famous film version of the Cóiste Bodhar is of course from the magnificent Darby O’ Gill and the Little People when King Brian tricks Darby into leaving the Cóiste Bodhar. 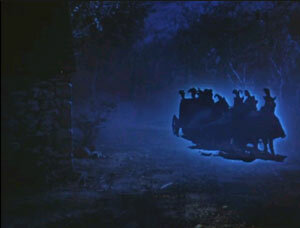 Still to this day I cannot hear the term Cóiste Bodhar without conjuring up images of the Dullahan (headless horseman) calling to Darby to enter the death coach from that film. All over Ireland you will hear tales a plenty of the death coach but this particular story takes place in Ballyduff. It actually came via a correspondence from Clonmel who sent it to a Mr. T.C Croker who included it in his book Fairy Legends of Southern Ireland. One fine summer afternoon Michael Noonan was walking into Ballyduff to collect a pair of brogues (shoes) he had left with the cobbler (shoemaker/mender). His way took him on the tow path alongside the river past the now derelict Hanlon’s Mill. To Michael’s surprise he could hear, as clear as a bell, the sounds of the huntsmen and hounds at full cry even though he knew this couldn’t be true as the Duhallow Hounds ( formed in 1745 they are the oldest continuous hunt hounds in Ireland) were in a totally different area. Fear took the place of Michael’s surprise when he heard the unmistakable ‘clack – clack’ of the mill’s mechanism working as it had been deserted years previously. He ran, as though the hounds were chasing him, all the way into Ballyduff. Upon reaching the cobblers a breathless but relieved Michael met his old friend and neighbour Darby Haynes. Darby was a carrier by trade and as he was wishing to wait for his nephew to get to town and no doubt wanting to wait in the pub he asked Michael to take his horse and cart home. Michael was only too happy to do so as he certainly didn’t fancy the walk home past Hanlon’s Mill especially as it was getting dark soon. The dark, as it turned out, was to be the least of Michael’s worries that night. The moon rose full and bright clearly lighting the road so Michael knowing that the horse had, had a hard day’s work drove slowly home. Settling comfortably back in his seat up in the cart Michael lazily watched the reflection of the moon in the river letting the old horse lead the way. Suddenly Michael sat bolt upright as the moons reflection disappeared it was a cloudless sky so where had a cloud come from? What Michael saw next turned his blood to ice, looking round he saw a large black coach draw silently alongside him. 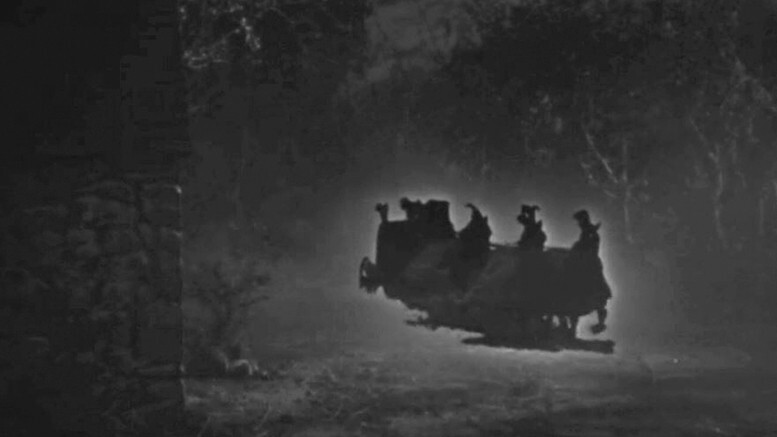 The coachman and the six coal-like horses were all draped in black and as this were not terrifying enough they were all headless. The coach quickly came abreast and passed the frightened Michael, the coachman laying his whip soundlessly across the backs of the horses disappearing as quickly as it had came into view. Michael Noonan, trembling, somehow made it home, settled the horse in the field and got sleeplessly through the night. The next morning standing by the field watching the horse Michael was pondering the previous night’s events when Daniel Madden, a huntsman to Mr. Wrixton of Ballygibben came riding into view at a mad pace. Stepping into the road Michael waited for Daniel to reach him. “For the love of God don’t stop me!” gasped the rider. “Whatever has happened?” Michael asked. Madden was able to gasp out that his master had taken a fit during the night and was at this minute close to deaths door. He was riding to fetch the doctor but told Michael if he wished to help he was to run across the field and get Kate Finnegan who was a midwife but at least had some medical training until the doctor could get there. Michael went as fast as he could but he knew it would be too late as he realised that the Cóiste Bodhar had claimed its latest passenger.